Nokia Lumia 800 spends 3 months in lake; still works! It seems that Nokia will forever be a smartphone legend, if not a player. While many people have had many experiences with the Nokia basic phones back in the day, which would involve them being dropped or even being washed away and still working, it seems that the Lumia range is made of the same fibre. Roger Nilsson went for a swim in a lake 3 moths ago and lost his Nokia 800. 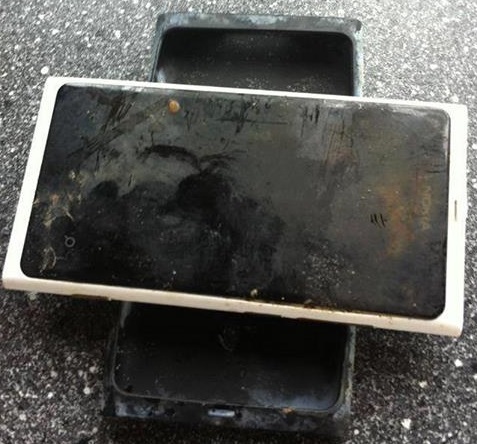 While all hope was lost for the phone, he was in for a surprise when he found the phone ashore, after 3 months covered in algae and lodged between some rocks. The fact that this is not even a water resistant phone adds to the lore. It seems like Nokia has kept up the quality it was so renowned for, even with the Lumia smartphone series. Nilsson claims that the phone still works like nothing ever happened – the battery works fine and the screen too. This makes us even more eager for getting our hands on the last major Nokia devices – the Nokia Lumia 1520, Nokia Lumia 2520 and Nokia Lumia 1320.